From single consumer orders to large bulk distribution projects, En-Ovations, Inc. will ensure your fulfillment needs are managed efficiently and economically when you rely on our one-stop, turnkey solutions. We provide a broad range of fulfillment, distribution, and logistics services from one of the nation's most centrally located delivery points. Our distribution facility offers 6,000 square feet of dedicated administration facilities as well as over 250,000 square feet of combined fulfillment, shipping and storage capacity. 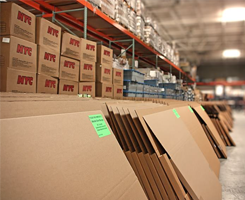 Learn more about our fulfillment and distribution services. As your fulfillment partners with over 25 years of experience in the industry, En-Ovations, Inc., understands its vital role in your businesses processes and success. We understand that fulfillment is a critical component in your businesses service and many times the last point of contact with your customer, therefore we take our role as your partner very serious. As veterans in marketing, distribution, fulfillment and logistics, we understand it is simply not enough just to provide satisfactory services using "yesterday's" technology. Our use of state of the art technology allows for rapid communications and information being readily available to our clients at the click of a button, thus dramatically altering their methods of manufacturing, purchasing and marketing of their products. The competition for market share, demands for lower cost solutions and rapid product improvement, providing En-Ovations, Inc. the ability to continually evolve and expand its products and services to support our clients creative distribution needs. Learn More About En-Ovations, Inc. Thank you for your interest. For more information, questions or comments, please use the information listed here to contact one of our fulfillment specialist. We look forward to hearing from you soon. While we are centrally located in the Dallas / Fort Worth (DFW) Metroplex and a large segment of our client base is located in the DFW Metroplex, En-Ovations, Inc. has clients from all reaches of US & Puerto Rico.